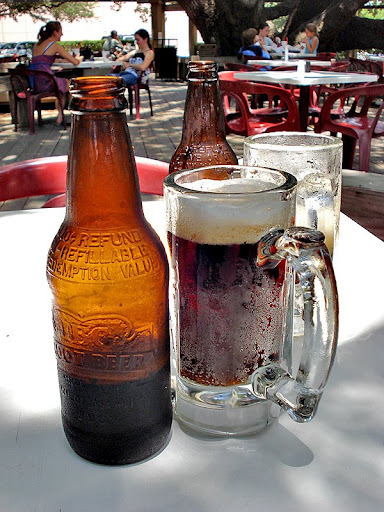 IBC Rootbeer & Ice-cold Mug! I am not a big hamburger eater, let alone a hamburger guru. I’ve always been more of a fish eater, but rarely turn down a well-prepared filet mignon. One of my favorite burger joints is here in Houston, Texas…Beck’s Prime. I believe there are three locations, but I only eat at one on Westheimer. A short distance from the Galleria. Why do I like this place? The burgers are awesome for one. Main reason to go to Beck’s Prime. Secondly, you gotta eat outside. Leave the indoor dining to those who forgot what scenery and fresh air. Beck’s Prime on Westheimer is located next to a library and behind a cleaners. As you can tell, I have no idea of the names since I’m not interested in Shakespeare and a clean shirt. I’m here for the almight burger. This location of Beck’s has a great staff. This time around the manager was very personable and on top of things. Here you can get various combinations of burgers. Do bring your appetite as we are talking 1/2 lb burgers. They offer other dishes like grilled chicken and I’m sure other great items…but as I said before, I’m here for the burger, so I pretty much stay to the left of the menu board. Here you can order nice wines, beer and IBC Rootbeer. Guess what I asked for? Not a beer drinker and no wine as I rarely drink alcohol in front of my kids…the wonderful frothy IBC Rootbeer. The manager offered use ice cold mugs from the freezer. Now that makes for a great rootbeer experience. Now back to why we came here. The burger. My favorite order is usually the same. A burger well-done but not dry, topped with a dripping hickory sauce (grab a load of napkins) with swiss cheese. It comes with American, but I’m not one for yellow cheese on a hamburger. 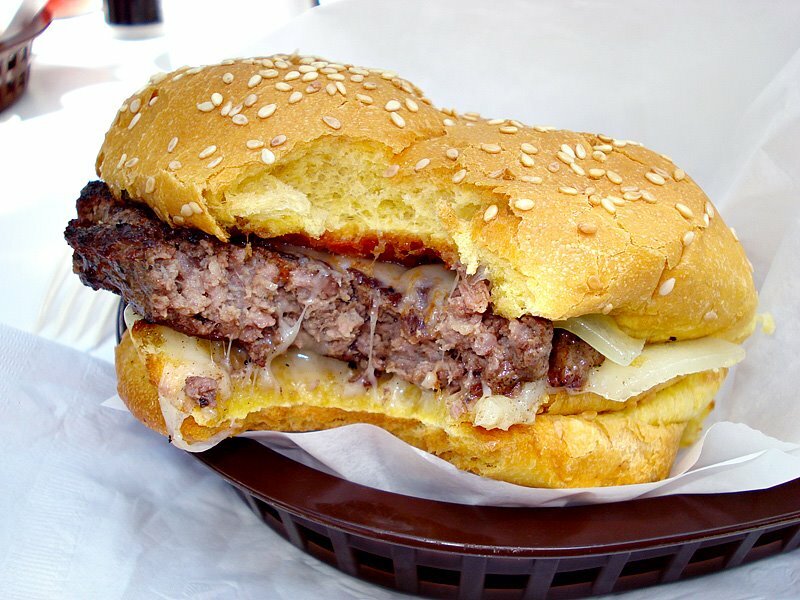 Call me un-American but who cares…this is MY burger! I grew up eating hamburgers plain and dry. I still do. Why cover it with vegetables? I want to taste what I came for! A nicely grilled burger with the only extras I asked for. This time around I forgot to ask for bacon. I love bacon burgers! My oldest son and I ordered out burgers…he ordered plain with lettuce and onion. We both ordered fries as well. My youngest who isn’t big on burgers, ordered the kids grilled chicken. 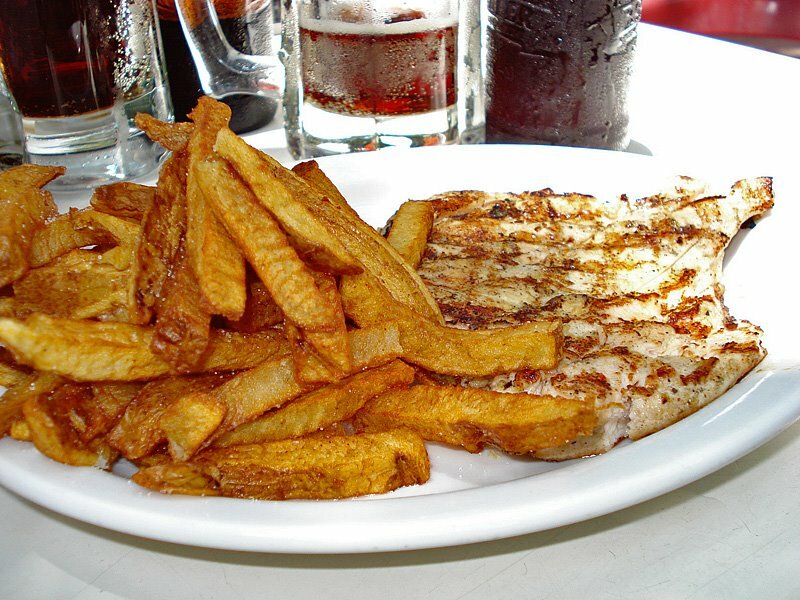 Not your normal chicken stripes or nuggets…but a very nice grilled chicken breast with fries. A great meal for kids without all the high fat. The temperature on this particular Saturday afternoon was nearing 100 degrees. 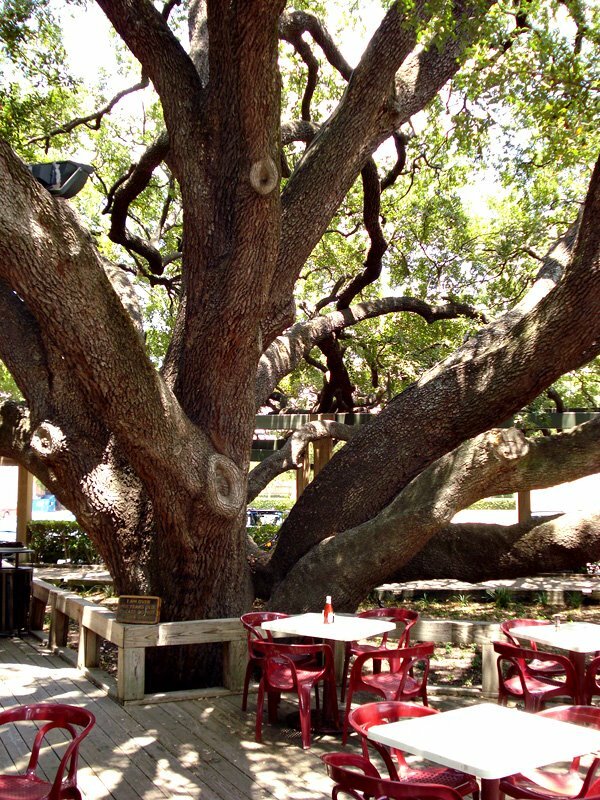 We still opted to sit outside under the two massive and I mean massive oak trees. 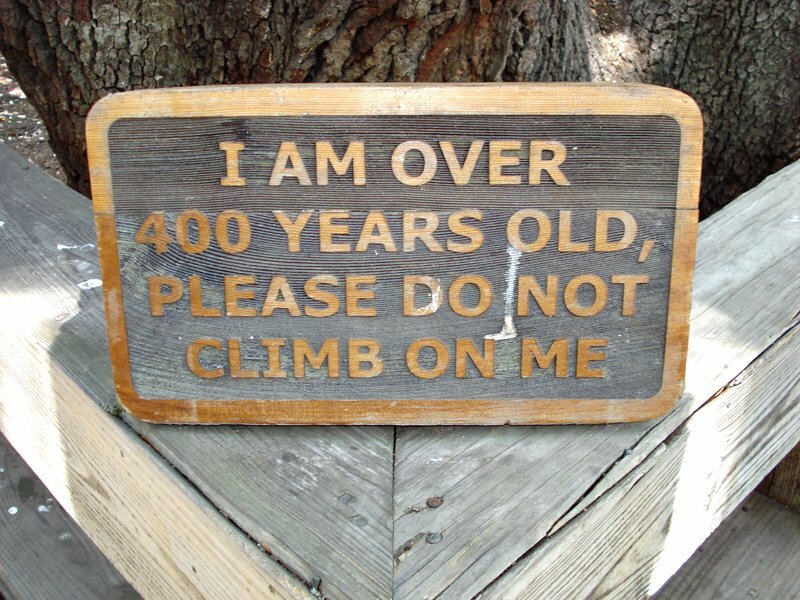 As you see here, one of them is over 400 years old. This is the second reason to come to this location of Beck’s Prime. 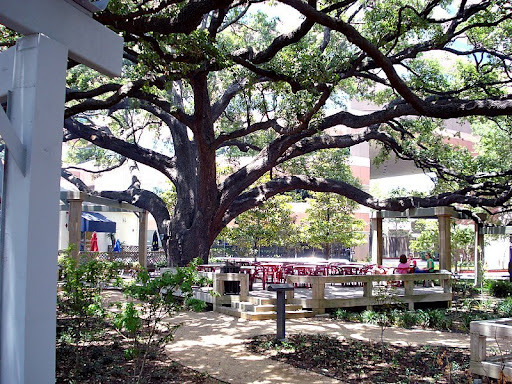 The branches are propped up by metal poles and gives us a natural canopy over the eating area. Full shade to add to my hamburger experience. It is one of my places where I bring out of town friends. Also as a side note, I do not frequent my favorite places too often…reason is, I want to keep it fresh each time I go as I do not want to wear the place out. Houston is a very large city, with so many restaurants (#1 place with the most in USA! ), there is no reason to wear out my welcome! As the remote buzzer went off, it was time to feast! Bringing out burgers back out to the sunshine with us. It was time to enjoy! As you see here, Beck’s buns are yellow not white. Why? They use the whole egg, yoke included. This gives the yellow appearance to the bun. No reason to discriminate against the yoke! My particular hickory/swiss burger as I call it is full of flavor without having to add or hide it in vegetables. Seriously, if you ever order a hamburger with extras…leave the vegetables in the garden or in your side salad. Enjoy your burger with what ever you add to it to get the full experience. I mean really…do you add lettuce on top of a brisket or a steak? No…well unless you’re me and add basil on a filet…but we’re not here to debate vegetable usage. Now to devour the rest of it! As you see here, my Beck’s Prime burger has a great outer color along with an uniform well done color without being dry. The liberal dose of hickory sauce was applied to the top with swiss cheese on top and the bottom. I actually like it this way. 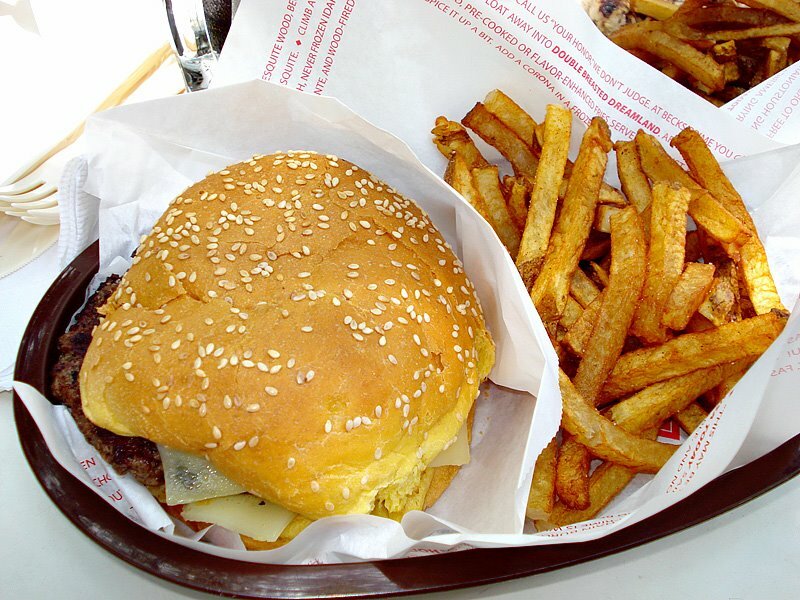 I rarely finish a hamburger but at Beck’s it’s a no thought process…savor the burger while you devour it. All in good time. Adding old fashion style fries compliment the burger. I usually like extra crispy fries but Beck’s is more of a tender fry, lightly salted. Burgers have friends and their friends are fries. Both bring out the best in each other, so order them together. lol. Now my youngest son had ordered the grilled chicken with fries. Doesn’t this look nice? Beck’s chicken is not dry, but tender and moist. Lightly seasoned, grilled and sliced. I never have to ask him what he wants from Beck’s. It’s always the grilled chicken. Hey, I’m just happy he’s eating! Kids we love’m but they can sure drive us nuts when it comes to their menu. I’m pleased with all they do try and like when they are with good ol’ Dad. This particular Saturday afternoon lunch was priced under $30. Not bad to be honest. I give this location of Beck’s Prime an A for Food, Location and a great outdoor experience. Their Kirby Drive location has no parking to speak of. Here on Westheimer if the parking lot is full, you are allowed to park in the library parking lot. Make the short walk under the massive trees to the front door. As I’ve said before, I rarely go out to eat, as I love having fun in my own kitchen. While the boys stay with me off and on during the summer, I treat them to places around Houston. Stay tuned when The Bond Boys make another trek outide my kitchen. You’ll never know where we may end up…and I certainly don’t know! Enjoy! Keep it fun! Keep it family!